Whilst in terms of outcomes, global politics and central bank offerings have been relatively subdued this week, it is this news that has been prevalent. Following UK Prime Minister Theresa May having her Brexit deal rejected for a second time last week, this week the Speaker of the House of Commons, John Bercow, has ruled out another vote on Theresa May’s Brexit deal if it was “substantially the same”. This saw May issue a letter to Donald Tusk (European Council President) requesting a 3 month extension to the UK’s planned exit from the EU at the end of this month. European Union leaders met on Thursday and set two deadlines for Theresa May, extending the enforcement of article 50 (UK’s exit from the EU) until 22nd May… however, this was accompanied with the caveat that if UK lawmakers do not approve her presented deal next week, the UK will have until 12th April to decide to leave with no deal in place, or to request a substantially long extension. With this in mind, to a certain extent this puts Theresa May in a clearer position, as any deal presented to UK lawmakers will essentially become a vote with 3 potential outcomes; Theresa May’s deal, a ‘no deal’, or a substantial extension (which could be seen as not fulfilling the will of the people!). Despite all of this rhetoric and some fluctuation in sterling, valuations in both the UK and European markets remain immensely attractive! The UK economy and markets in particular were backed by an accommodative and dovish tone from the Bank of England (BoE) head, Mark Carney, on Thursday as the BoE kept headline interest rates unchanged at 0.75% stating that uncertainty surrounding Brexit keeps them hesitant to increase rates and leaves them accommodative in terms of policy. 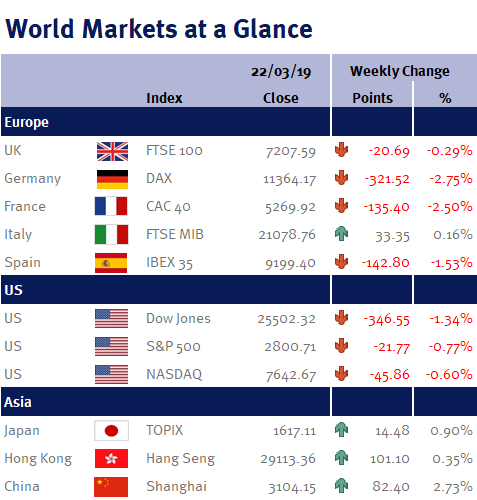 There was a similar tone from the US Federal Reserve on Wednesday, and whilst US markets continued to perform strongly this week, they were boosted by US interest rates remaining unchanged at 2.5% at the upper bound. However, it was the dialogue from Head of the Fed, Jerome Powell, that accompanied the rate announcement that was key as he ruled out any rate hikes this year based on current global data and trade uncertainty, stating that their next move could even be a rate cut citing the inflation target goal of 2% as rationale. This was a huge buoy for global markets as the world’s largest economy’s central bank remains accommodative, and whilst there are concerns surrounding global growth, central bank support is what is predominantly dictating sentiment and thus markets. With trade in mind, next week’s deadline for a trade agreement between China and the US looks set to be postponed further by US President Donald Trump, as whilst Trump’s chief negotiators, Robert Lighthizer and Steven Mnuchin, are headed to Beijing next week, Trump warned on Wednesday that the US may leave tariffs on Chinese goods for a substantial period in order to ensure that the Chinese comply with any trade agreement. And, whilst it is yet to be seen how Chinese President Xi Jinping will react to this manoeuvre, postponement of any trade deadline is an indicator that both parties are keen to strike a trade deal, and whilst it will likely be tariff laced, this would be a boon for the markets and global trade. Elsewhere we saw Chinese President Xi begin a tour of Europe on Thursday with a three day trip to Italy. Xi’s European trip is in order to boost China-Europe ties, with the Italy trip specifically targeting Italy’s involvement in the Chinese trade and infrastructure project, the ‘one belt one road’ initiative, that the Italian’s are keen to be part of. In terms of data, on Tuesday we saw the UK weekly earnings data beat expectation at 3.4%. This was accompanied 3 month unemployment rate data beating expectation and prior, at 3.9%. On Wednesday UK inflation data (CPI) was released coming in at 1.9% year on year. Thursday saw US jobless claims beat expectation, and Japanese inflation miss estimates coming in at 0.2%.